The end of the millennium was tumultuous for the Strategic Command in Offut, Neb. It had been combined with the Air Space Command. It had seen the addition of new missions: global strike, integrated missile defense, information operations, space, and integration of command, control and communications. And in 2003, the Defense Department threw in responsibility for combating weapons of mass destruction. 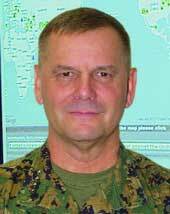 "The portfolio obviously was pretty broad," said Marine Corps Gen. James Cartwright, who in 2004 became Stratcom chief. During the next three years, he transformed the command's business operations; cut staffing by 75 percent; updated workforce skills, IT operations and even the way decisions were made; and changed Stratcom from a Cold War legacy into an agile, 21st-century military organization. Cartwright, now vice chief of the Joint Chiefs of Staff, has been named the 2007 Defense Executive of the Year by Government Computer News, a sister publication of Washington Technology. Washington Technology Contributing Editor Sami Lais recently talked with Cartwright at his Pentagon office. Q: When you took command of Stratcom, you gave groups of academics, "graybeards" and businesspeople 30 days to devise ways to improve Stratcom operations. And you took the most advice from business? Cartwright: [Private business] had, one, already moved to a global footing, and two, started the transition out of a purely industrial construct and into an industrial-[information technology] construct and seen [the nature of] competitive advantage change. They had figured out how to think about an environment in which change is significantly faster than a lot of purely industrial constructs allow you to go. Resourcing, materials, manpower, intellectual capital ? how do you think about them on a very different, a global, scale? Q: What areas were you looking for? Cartwright: Two pieces I wanted them to give me thoughts on were: How do you partner with business? Because the reality of the world we're living in is it's not the military that's normally being attacked but our economy and our way of life. Q: You've talked about opening access to information. How? Cartwright: The idea behind the Napoleonic construct that we have ? which basically is layers of assessment that go on before a decision is made ? is to work out the ambiguity of the information. There's a business rule that says the size of your headquarters is in direct proportion to the ambiguity of information that you have to deal with. More ambiguous information means a larger headquarters. The problem with that construct is that you can't get a relevant decision in time to affect the outcome if all of your time is spent in staffing ? I brief you on what I know, and here's my conclusion; you brief him on what you know and give him your conclusion, and so on until [you get to the decision-maker]. Most of that process is about discovery, and very little is about the consequences of the decision. So the question is, in a critical timeline, how do you get discovery to be very short for the large group and expand the other end of the timeline to focus on the criticality of the decision. Q: So you're flipping the timeline around? Cartwright: Yes, but also, there's always an assumption, particularly on Monday morning, that you have to deal with perfect information. No warfighter deals with perfect information, so that shouldn't be part of the calculus. You should work toward that, but it shouldn't compromise the process. So No. 1: Get the discovery activity as short as possible. And No. 2: Quit worrying about who knows that part of the information. Q: And you got senior officers to go along? Cartwright: What we were able to do is show how much quicker you could outmaneuver your adversary by collapsing the discovery time. We treated higher headquarters as the adversary as much as we did people in another country. But the thing is, if you could outperform your boss' headquarters, out-turn them routinely, almost anything you were working on ? if it was right and shown to be valid ? would be accepted. That showed value, and every time we showed value, people were willing to take risk. Q: How do the advances in cyberwarfare ? and the attacks in Estonia ? and globalization in general change the equation? Cartwright: Say the U.S. government is dealing with U.S. Corporation X. They're a global activity. As the U.S. government, we can put regulation on them locally, but unless we help them on a global scale, we're just a regional activity to them. So what is going to change about the relationship between nation-states in this globalized environment, and what's going to change about entities that aren't nation-states but throw weight because of access to the technology of weapons of mass destruction or the access to just plain technology that allows them to compete on a global scale? At some point, we've got to come to the realization that we're going to have to adjust our laws and how we relate to other societies, and we haven't come to grips with that yet.